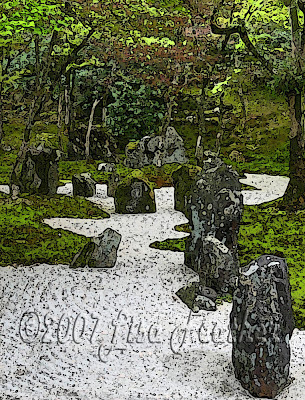 This image was captured at Komyozenji, a Zen temple located in Dazaifu,on the island of Kyushu in Japan. This exquisite rock garden is one of several that can be seen on the grounds of this temple. It can be viewed from many angles throughout the temple and adjacent tea house. This peaceful Zen garden features swirling gravel, islands of soft moss, and mottled boulders beneath a canopy of leaves and arching branches. The rocks in this garden have been carefully placed and tended. They have become not only a part of the landscape but a part of the story that the garden tells.